Mini-Kom is a small animal closed circuit anaesthetic machine that features low operational costs and minimal/absent pollution. 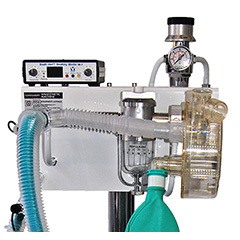 The Mini-Kom with two in circuit vaporisers (AN-7570) enables the choice of 2 of the 4 most commonly used volatile anaesthetic agents (Isoflurane, Enflurane, Sevoflurane or Halothane). Available in single or double in circuit vaporisers. 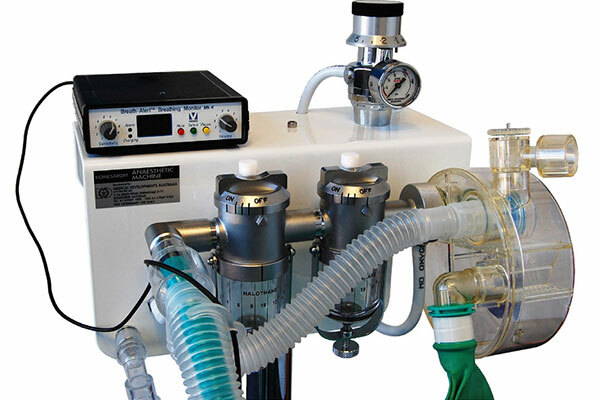 Provides accurately metered oxygen flows between 0.1-3L/min and incorporates an Oxygen Flush (Bypass) control which operates at all settings to rapidly inflate the breathing bag when required. Soda Lime 1kg pack with 400g capacity filler and adaptor supplied. 1 Isoflurane vaporiser and 1 Halothane vaporiser. 1 Isoflurane vaporiser and 1 spare Halothane vaporiser bowl. Pressure Relief Valve with manual override. Washington T-Piece Circuit (including 1/2L rebreathing bag). Universal `F”Hose in Hose’ Breathing Circuit (2 sets) (including 2L rebreathing bag). Lightweight, portable with powder coated white steel base. 100% oxygen technique with low resistance vaporiser. Calibrated vaporiser bowls to measure dosage by volume. Minimal/absent pollution released into the operating theatre. Trolley or wall mount assembly.